Oil on canvas: 90.2 x 128 cm. 35 1/2 x 50 3/8 in. Born into a family of artists, Danckerts began his career at The Hague becoming a Master there in 1651. Sometime after 1653 he travelled to Italy and joined the community of Dutch-Italianate painters in Rome specialising in luminous views of the campagna. By 1657 he was in England, quickly appointed court painter to Charles II at the Restoration, and employed to execute views of the newly occupied royal palaces at Windsor, Hampton Court and Greenwich. At the last the new king had erected a new wing to complement the Queen’s House designed for Queen Henrietta Maria by Inigo Jones. This gives our view a terminus ante quem as the new wing has not been started and instead there are the remains of the old Tudor Palace of Greenwich consisting of two towers, the one on the left on the site of the old gatehouse and that on the right standing beside the flat area which delineates Henry VIII’s old Tilting Yard. The landscape is therefore a significant historical document illustrating the evolution of the Tudor building into the baroque palace, designed by Jones’s pupil John Webb, that we see today. To the left crowning the hill is the Royal Observatory built on the foundations of the old Greenwich Castle on the recommendation of Sir Christopher Wren in 1675. It was initially called Flamsteed House after the first Astronomer Royal John Flamsteed. Dutch painters. 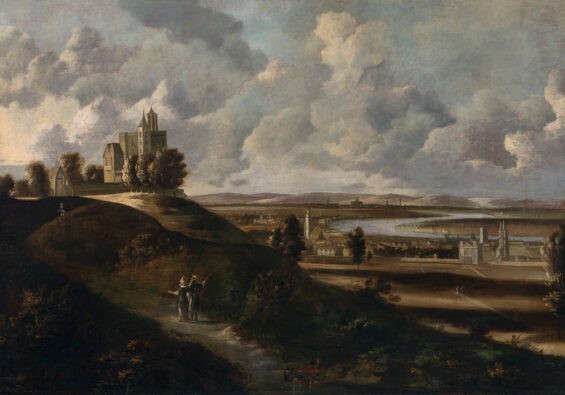 As well as the royal collection, his paintings are in the Government Art Collection and the National Maritime Museum, Greenwich, which has a later version of this view with Charles II’s palace where the old Tudor building stood. I am writing to enquire about "View of Greenwich circa 1660"